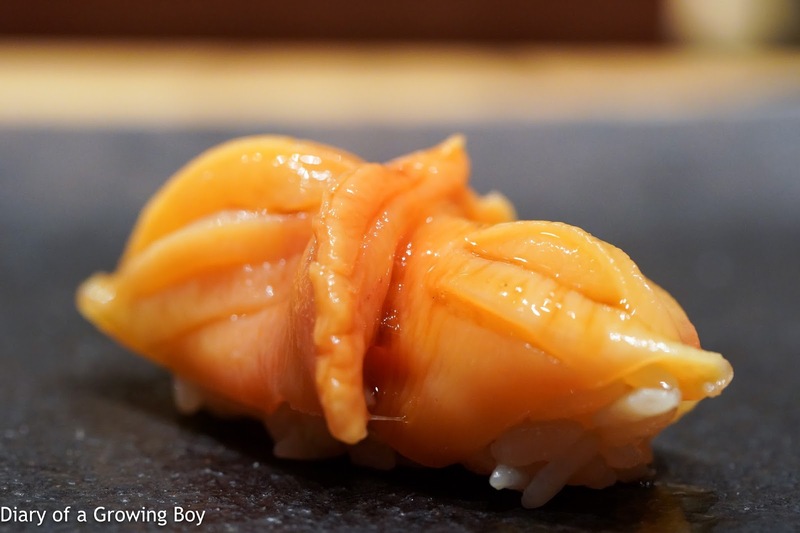 After some back and forth, we finally settled on late dinner at Sushi Imamura (寿司処 今村). 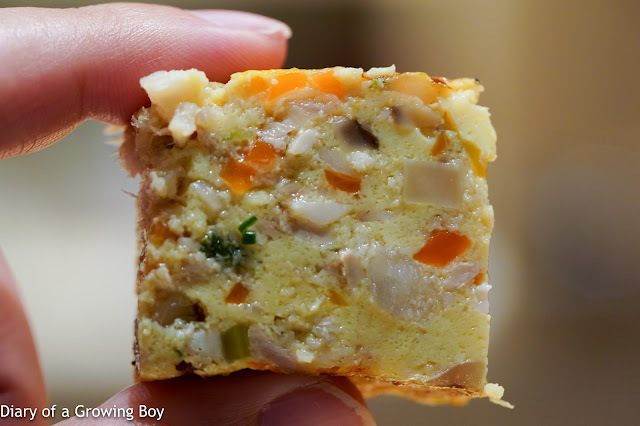 It's an old favorite I used to frequent more than a decade ago, but these days it's largely neglected by my friends from the "foodie crowd". It's always been good, though, whenever I have chosen to go back there. Given that I'll be doing another sushi place for dinner tomorrow, I originally wanted to take a smaller set tonight. 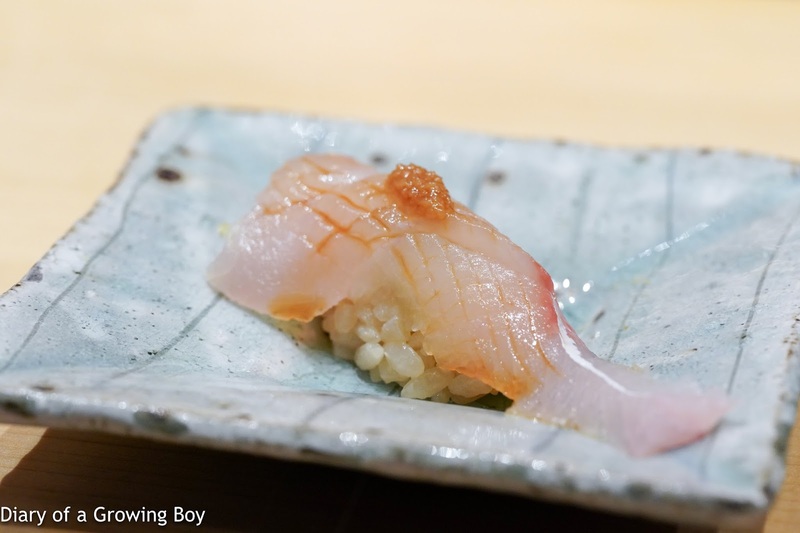 But somehow it didn't work out that way... as I didn't want to have only sushi and give up on otsumami (おつまみ). The staff did come and ask us about our dietary preferences, so I dutifully told them that I didn't want tuna of any kind. 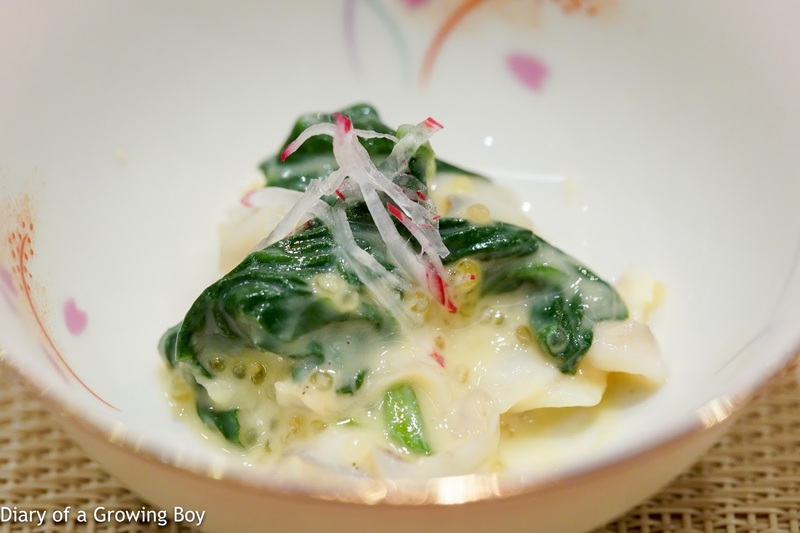 Cockle (鳥貝) trimmings - with white miso, flying fish roe (飛び子), radish chiffonade, and greens. 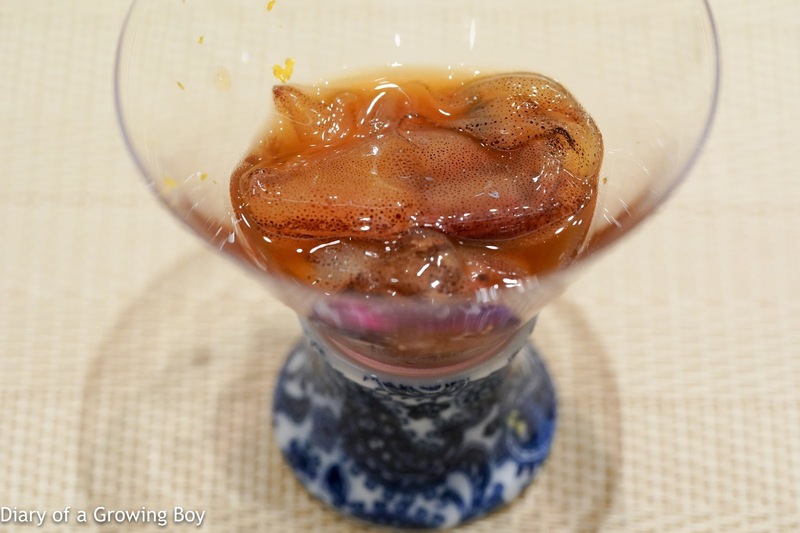 Mozuku (モズク) - lots of vinegar, a little grated ginger. 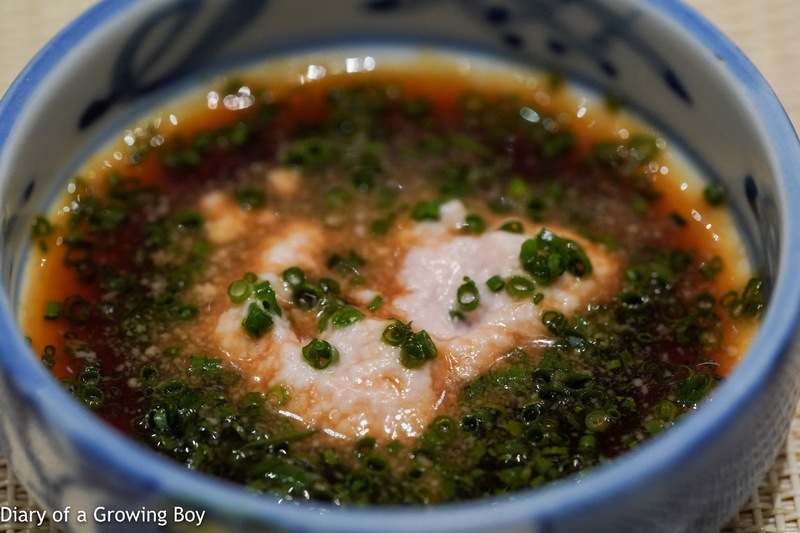 Filefish (皮剥) - crunchy texture, dipped in soy sauce with filefish liver and finely diced spring onions. 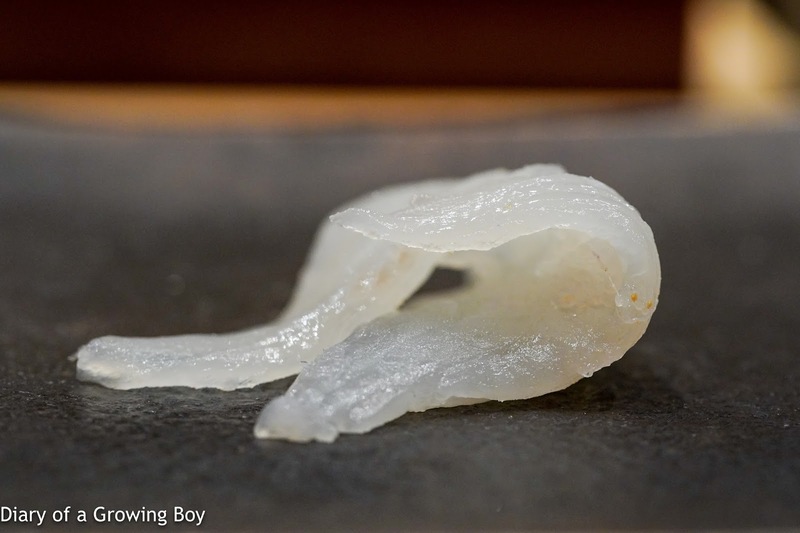 Squid (墨烏賊) - very thick cut here, which delivered a good amount of bite. 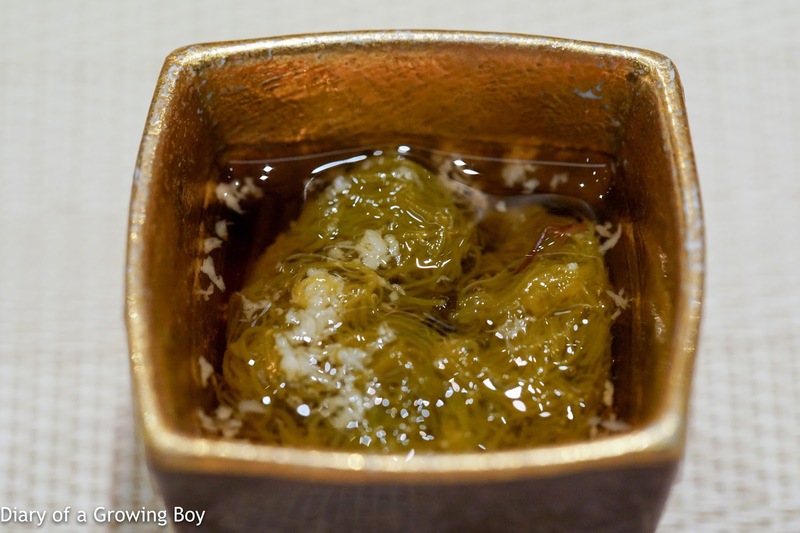 Served with shavings of yuzu (柚子) zest. 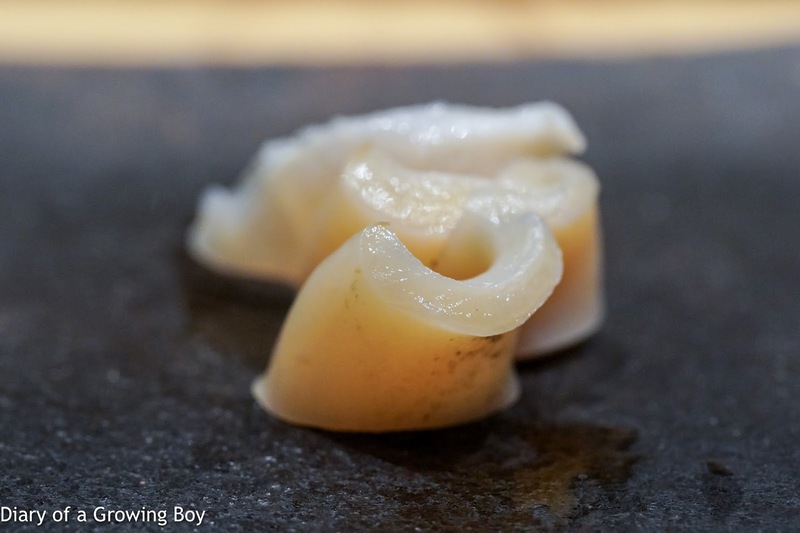 Whelk (つぶ貝) - dipped in fragrant sesame seed oil. 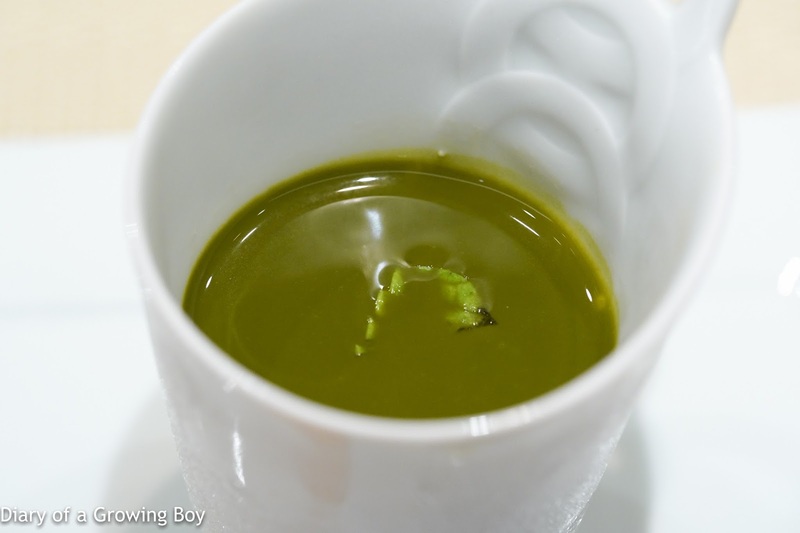 Chawanmushi (茶碗蒸し) - with firefly squid (蛍烏賊) on top. Seasonal and sooooo delicious. 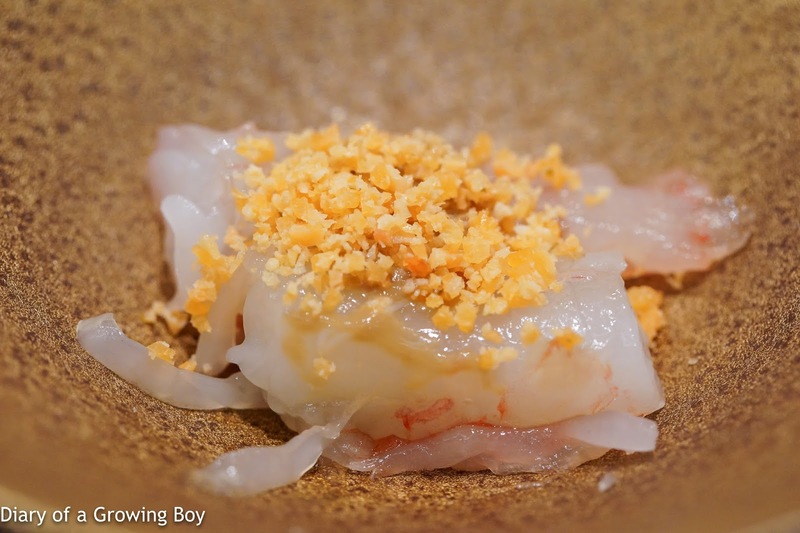 Botan shrimp (牡丹海老) - with tomalley and crunchy bits made of shrimp roe. 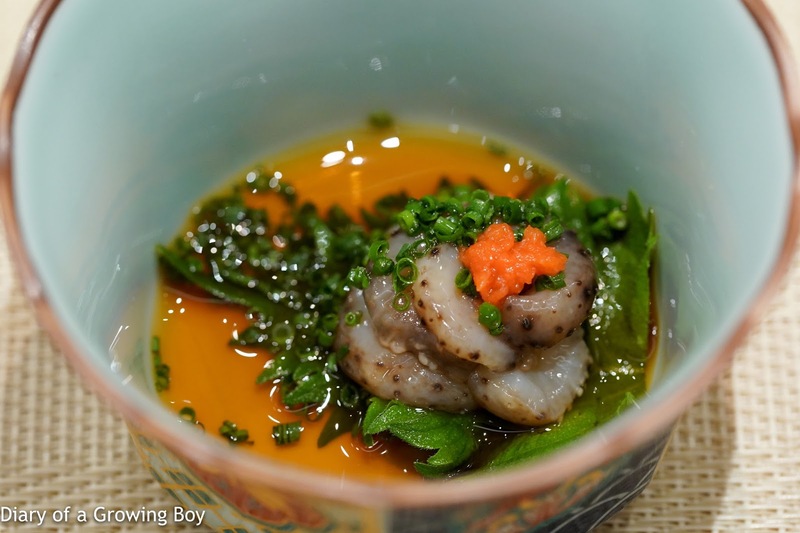 The tomalley had pretty strong flavors and tasted like kanimiso (蟹味噌). 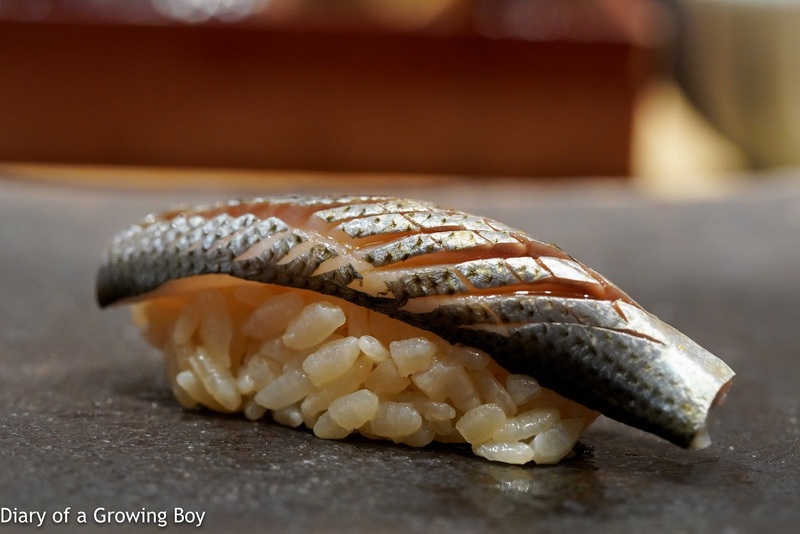 Ark shell (赤貝) - from Yamaguchi Prefecture (山口県). 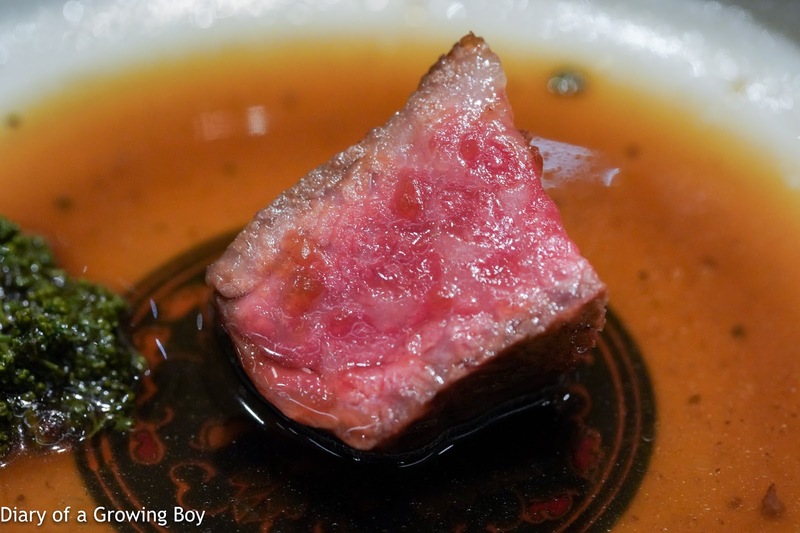 Surprised to taste the vinegar in the shari (しゃり). 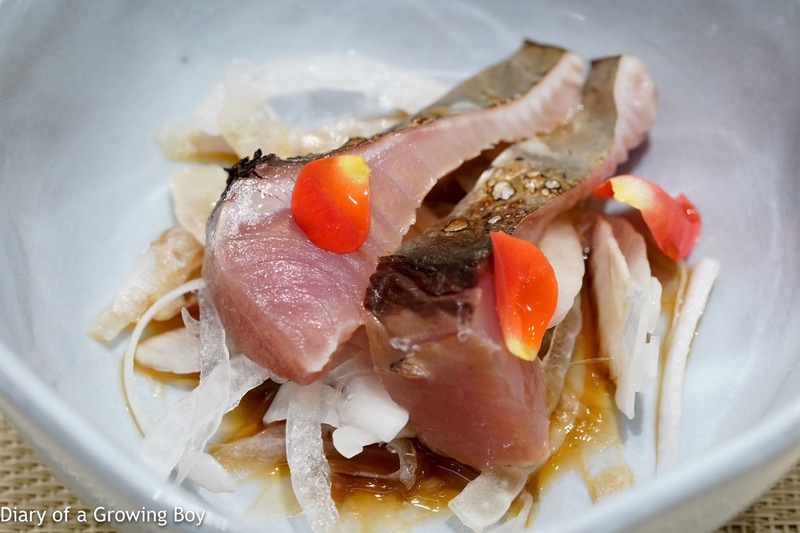 Striped bonito (歯鰹) - the marinated tataki (敲き) was definitely a little smoky, and came with new onions. 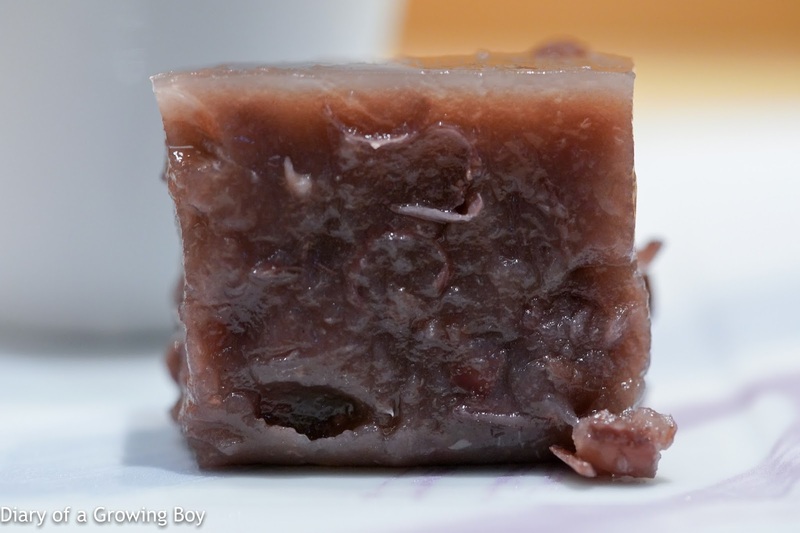 Gizzard shad (小肌) - more fatty than I had expected. Nicely done. 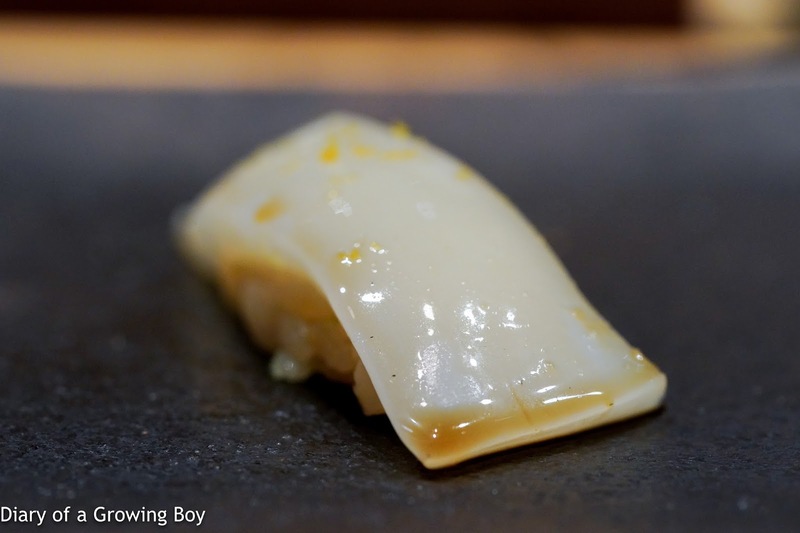 Tea-bathed sea cucumber (茶ぶりナマコ) - very crunchy and came marinated in ponzu (ポン酢), along with chopped spring onions and marinated grated radish (辛子おろし). 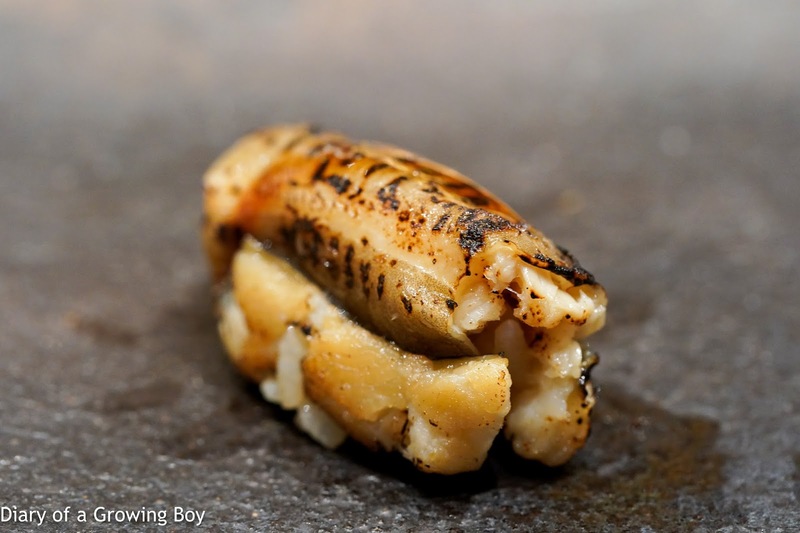 Fukusayaki (袱紗焼) - despite how it looked on the outside, this was not your average tamagoyaki (卵焼き) with shrimp and fish paste. This came with diced bits of vegetables and fish inside. Wagyu with sansho flowers (和牛 花山椒) - Imamura-san wasn't sure exactly where the beef came from, but it was somewhere in Kyushu (九州). 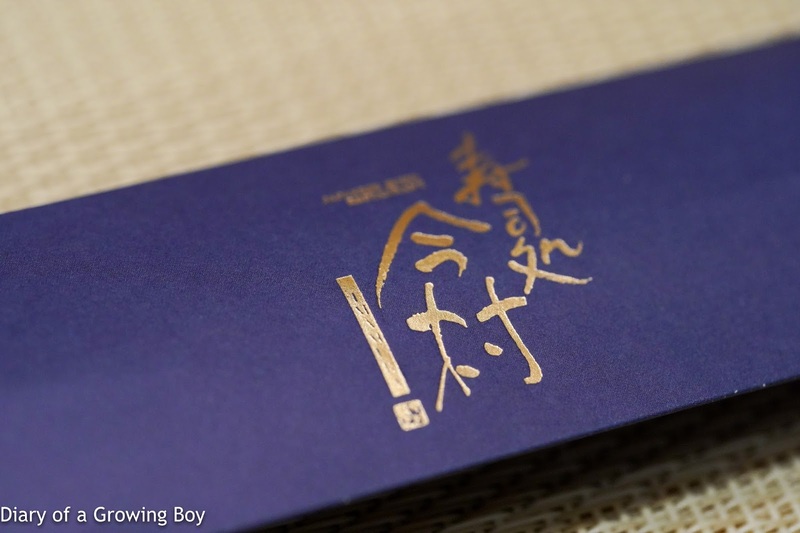 The surprise was the sansho flowers (花山椒) on top, which were so fragrant and delivered that numbing, tingling sensation on the tongue. 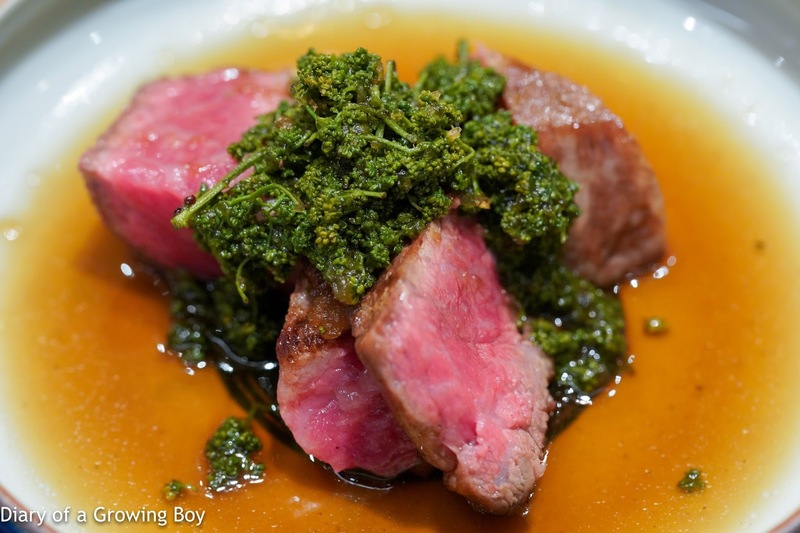 The beef was very marbled and tender. Delicious. 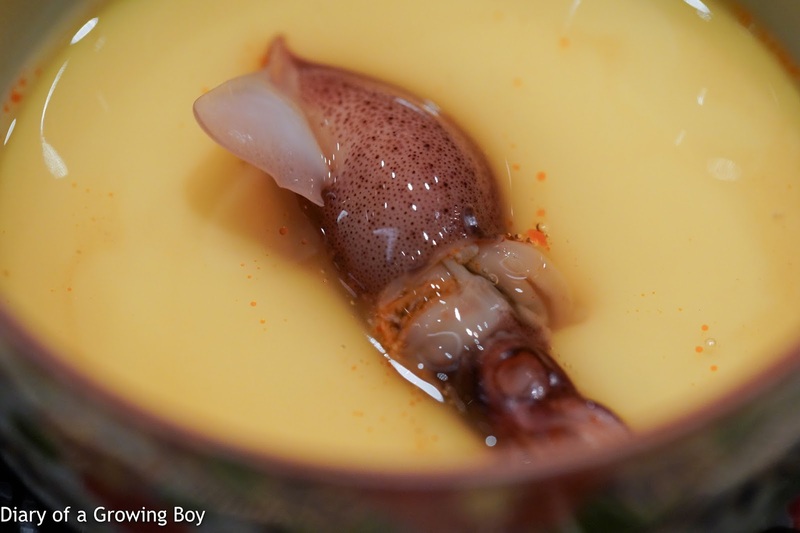 Firefly squid (蛍烏賊) - these were a little bigger than I had expected, and the marinade was on the sweeter side. 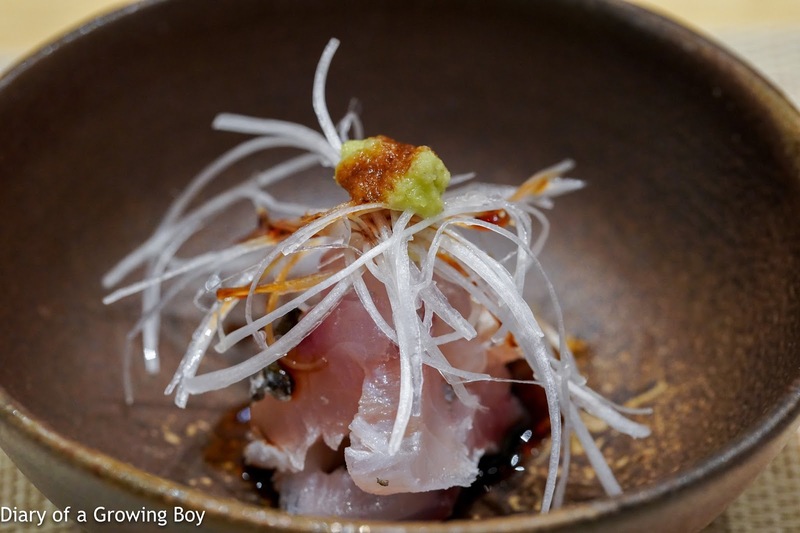 Yellowtail amberjack (平政) - my substitute for fatty tuna. Sea urchin (雲丹) - from Fukuoka (福岡). A little more depth of flavors. Barracuda (魳) - my friend brought me some smoked soy sauce from Japan, and she wanted Imamura-san to try it. 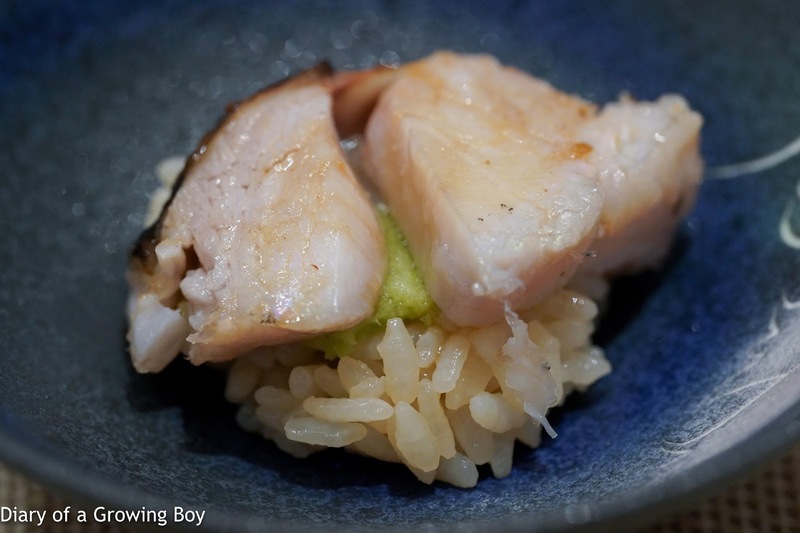 He figured that it may work with a white fish, and served up this bowl of shredded barracuda marinated in kelp (昆布締め) with Japanese leeks, then drizzled soy sauce on it. Not bad. 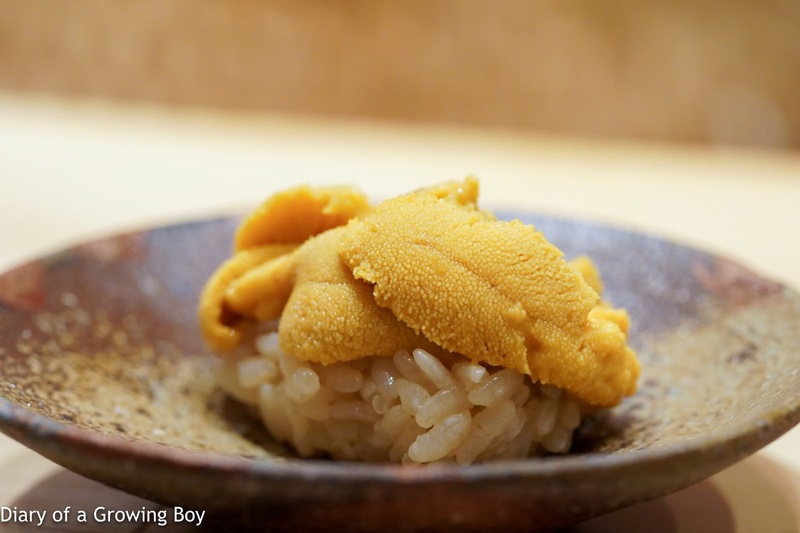 Purple sea urchin (紫雲丹) - I saw that Imamura-san still had this from Hadate Suisan (羽立水産), so I made sure we were getting it. 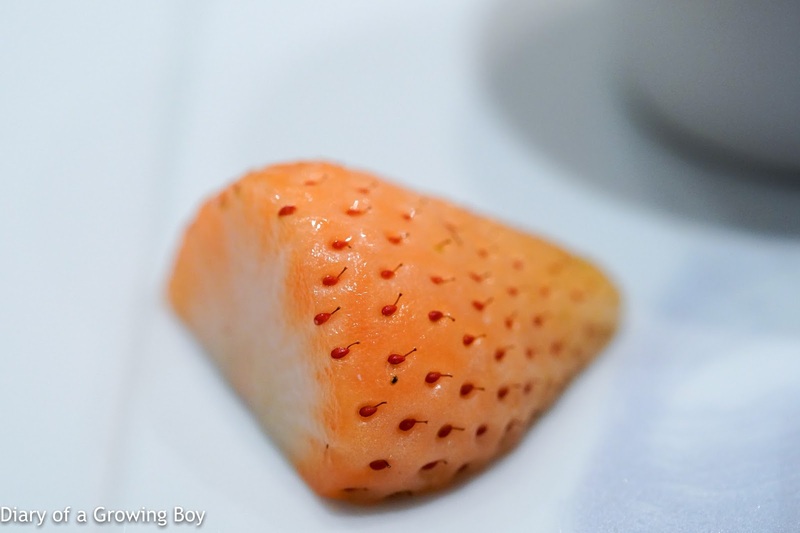 Very creamy, very sweet. Yum. 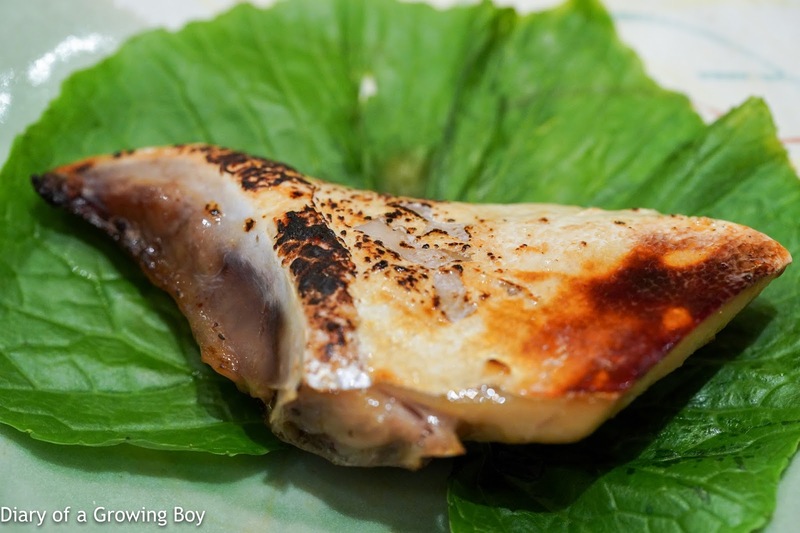 Conger eel (穴子) - surprising amount of bones here. Dassai Beyond (獺祭 磨き その先へ), BY 26 - seimaibuai (精米歩合) not disclosed. Good depth of flavors, medium dry with long finish. Nose was rich in fermented rice notes. Very clean. 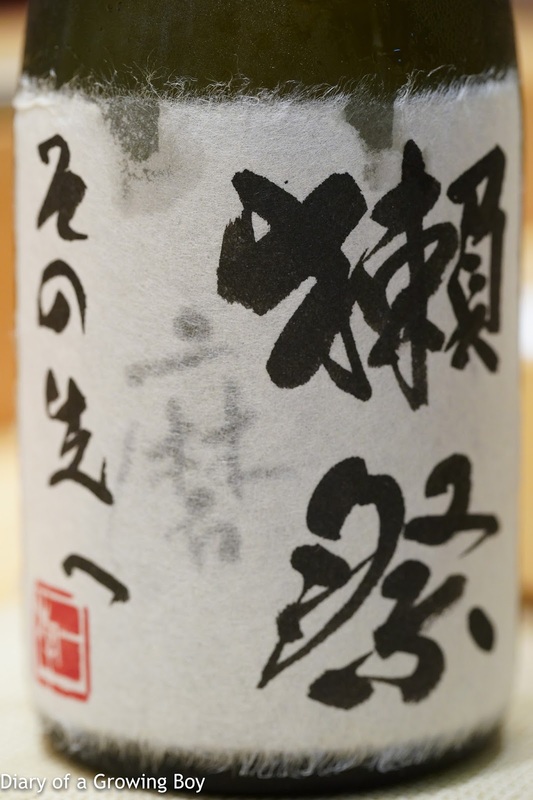 Kokuryu Daiginjo Junmaishu Ishidaya (黒龍 大吟醸純米酒 石田屋), BY 27 - seimaibuai (精米歩合) of 35%. Pretty smooth and soft, much lighter on the palate at first. Slight hint of dryness and a bit dry on the finish. After warming up this was much better, with a lot more depth. Good to catch up with my friends after a long time, and glad to see that Imamura-san is still delivering the goods for his guests.